NOTE: Free book only in the United States. To receive the book internationally requires an extra $25 to cover the additional shipping. Instant reset principle – Born’s Bag allows you to instantly reset for routines/sets that do not instantly reset at all. For strolling events, I prepare several Born’s Bags in my case. When the time is right, I grab one to perform a unique specialized set that is not part of my usual strolling act. Rather than having to reset anything, I simply drop this bag in my case, and take another which is ready to go for the next performance. Never be the performer that has to reset! 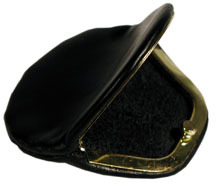 Production items – Born’s Bag provides the perfect cover for production items such as jumbo coins. 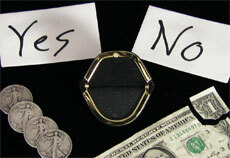 By attaching a holder to the inside, you can easily secretly access the item while performing. Ditching items – By placing a magnet in the bottom of Born’s Bag, this creates a great place to ditch metal/magnetic items in performance. I have had this for a month or so. I love this product. I mostly perform in casual settings or outside, so this bag allows me to carry a good amount of magic in just a shirt (no vest or jacket). There are similar bags out there, which I have experimented with. Most with similar size do not have the functionality (easy access and sit unobtrusively on the back). And those with similar functionality are too big. The bag is very high quality. The video gives you a clear idea of what you are getting. The hardest part is not over stuffing it, which compromises functionality (finding stuff) and its sleek look.